Lately I've been drinking a lot of tea. My brother got me some blooming tea last year for Christmas and that stuff is good and fun to brew. I got some more for Christmas this year along with some loose leaf tea, a glass teapot, and a to-go mug that brews tea. So I will be drinking lots more tea this year. Tea can get expensive so why not make your own? There's lots of herbs out there with all kinds of different beneficial properties. 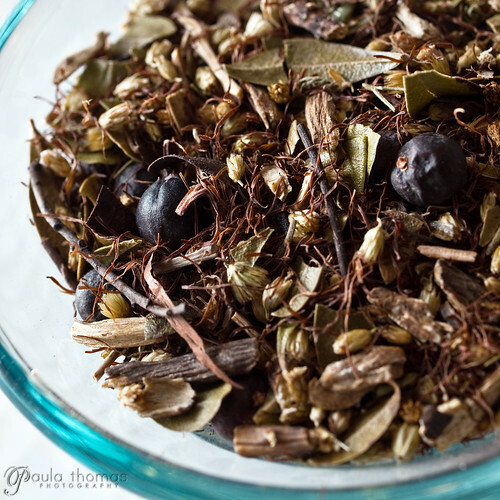 I just put together some herbs to make a tea good for your digestive system, specifically for your bladder and kidneys. It consists of juniper berries, cornsilk, echinacea purpurea root, yarrow leaves & flowers, and uva ursi. I got all of the herbs, except the uva ursi from Mountain Rose Herbs. I found the uva ursi at Tenzing Momo at Pike Place Market. herbwisdom.com is a great source for looking up different herbs and their benefits. A lot of herbs have multiple benefits. For example, uva ursi is known to treat UTI's, diarreah, high blood pressure, e-coli, and various infections. Making your own tea with a blend of herbs can be more beneficial than drinking the store bought stuff. Give it a try!